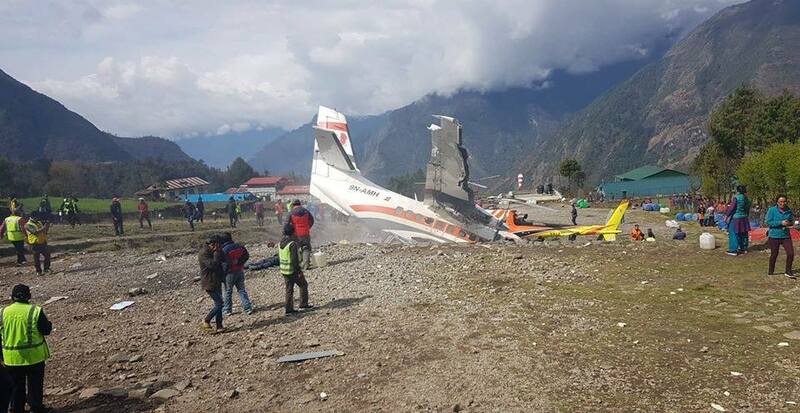 KATHMANDU, April 14: At least three people have been killed when a Summit Air plane collided with the parked choppers of Manang Air and Shree Air while taking off from Lukla-based Tenzing Hillary Airport in Solukhumbu district on Sunday, confirmed Nepal Police. The crash occurred as the aircraft 9N-AMH skidded off the runway while preparing to take off and hit two helicopters parked at around 9:30 in the morning. The plane was taking off for Ramechhap district. The police have identified the deceased as tourist police officer Assistant Sub Inspector (ASI) Ram Bahadur Khadka, Summit Air co-pilot S Dhungana and ASI Rudra Bahadur Shrestha. Lukla Crash Update : The co-pilot of Summit Air Sunil Dhungana and an assistant sub inspector of Nepal Police Ram Bahadur Khadka are confirmed dead. While the captain and airhostess of Summit Air, Captain of the chopper and another policeman on ground are injured.Approximately one year ago on 16th of April 2018, the same aircraft 9N-AMH faced an incident in the same airport during landing due to technical glitch in rudder steering and today's accident also seems to be of similar nature. Khadka and Dhungana died on the spot. ASI Shrestha, who was airlifted to Kathmandu, breathed his last while undergoing treatment at Grande Hospital. Four passengers onboard the plane including Manang Air Pilot CB Gurung sustained injuries, according to the police. They are undergoing treatment at Grande Hospital.